Discussion in 'Reviews' started by Jacob Peterson, Jun 18, 2018. Hey guys, so we are all probably familiar with the Kabar Mk2, often called the USMC fighting knife, or just simply a "Kabar". Many of us are pretty familiar with its history, and understand that it was intended as a fighting utility knife, but somehow through lore and folk tales, it has become something more. Nearly any "survival knife" discussion that pops up with see droves of people touting the Kabar as the ultimate survival knife; "if its good enough to be issued to our fighting soldiers since WWII, its good enough for anything!" But is it issued to our soldiers? Is it a viable choice as a survival knife? Is it a viable choice as even a Bushcraft knife? I had my doubts, and also wanted to talk about the history of the blade, so I dove head first into a full on session of reviewing, and the results might be shocking to some, and fully expected by others. This was all possible thanks to my patrons on Patreon, I believe people get a fully different reviewing experience when the products that they are using aren't paid for by the company that made it! I hope that you will agree. chris97, holygoat, freebirdfb and 7 others like this. The Kabar has already been proven in such places as Guadacanal....Saipan...Tarawa....Iwo Jima....Okinawa. It has helped many a U.S Marine see the sun rise the next morning. It is great for what it was designed to do. They hold a sacred place in many of vets hearts. That is all. Gizzybear, 1911srule, fx77 and 23 others like this. It was a cheap tool that was often abused and used like any other tool in the military. It holds a sacred place in the hearts of many vets, that should probably be all, functionally speaking in todays market, but sadly it isnt. El Bandito, freebirdfb, azmike9 and 3 others like this. All personal opinions are debatable, here's mine. A KaBar MK11 or in my case a Navy MK1 are just fine for bushcrafting purposes. The MK11 was designed as a fighting knife firstly and has proven itself, the majority of bushcrafters are not combat trained knife fighters, rock wall scalers or lumber jacks without the proper tools/gear. Choosing a knife as your life depended on it (survival) is moot, fact is the majority of epic survival situations in the last 75 years of so including young girls/boys survived without any type of knife at all. They all survived with the #1 essential of wits #2 water, #3 shelter, #4 fire if temperature or other situation warrants and after a week or so #5 food source. No doubt even a jack knife might have come in handy but by no means essential. LostViking, 1911srule, freebirdfb and 13 others like this. I actually agree. The KaBar is in fact an adequate Bushcraft knife, although like you I feel that the navy Mk1 is better ergonomically. The issue with a survival knife is that unless you are purposefully pushing your own limits, your survival knife will be the one you have one you. Do lots of people survive their situation with nothing? Sure. Lots of people survival car accidents with no seatbelt. Im one of them. Lots of people survive high speed motorcycle accidents without a helmet. Im one of them. Lots of people stop fires without fire extinguishers, stop muggers with bare fists, carry a gun without a tourniquet, etc, but does that make it wise? Since RedBull man can jump 200ft into water without injury does that mean we should all start cliff diving? Put simply, the Kabar will work, ESPECIALLY if you understand and respect its limits. The people who worship their knife often don't realize that it does have limits. Its not magically endowed based solely on the number of Nazi's its killed. In todays market, there are much, much better knives for any application. That's pretty much what the whole review boils down to. If kabar would get rid of the square jointing of rat tang to blade in itself with no other change, the design would be that much more viable. How they don't do a Mk2 lookalike that is full tang... I don't know. As far as what is fine for bushcrafting purposes, nearly any knife that you can keep an edge on with a decent handle is fine for Bushcraft purposes, so that's a low bar to hold. Heck, I have videos of me doing some pretty nice feather sticks left handed with an 8lbs hewing axe that is 200 years old. But yeah, for Bushcraft/ utility, the Kabar works. No dispute. freebirdfb, central joe, DirtmanDave and 1 other person like this. First I doubt any Nazi’s were ever killed with a Ka Bar, Marines fought on a different front. Ka Bars did not start entering service until 1943 and then only issue to crew served weapon crews, BAR gunners, M-1 Carbine and submachine gun issued men. It was not until 1944 that the knife was finally issued to all combat Marines that wanted one. In that brief period of issue they became one of the most enduring symbols of a Marine. How beloved is a Ka Bar? During Vietnam, when an M-60’s gunners belt had become so full of pouches, canteens and other gear that there was no available space left for their Ka Bars, and their load out had reached ungodly weights, the men would make a new hanger wire for their 1911 holster and hang the Ka Bar in the new space the hanger formed behind the holster rather than not carry them. The odds that an M-60 gunner would survive long enough to have to use the 1911 let alone the Ka-Bar in a fight were very long, sadly machine gunners are the most common target in a battle, but it’s added weight was insignificant compared to its value around camp and as a tool to dig holes, open ammo cartons, open meal cans and the hundred other tasks a combat knife could do. They also made fair bullet deflectors too as the Force Recon Corpsman Doc Norton would learn when his stopped an SKS round fired from just feet away in an ambush. The Ka Bar was shattered into three hunks but as he had it on his shoulder strap, over his heart, it no doubt saved the future Marine officer from a certain death. 1911srule, fx77, happywanderer and 23 others like this. I carried my K-Bar for 25 years as a grunt. It has been a lot of places, seen a lot of different things, been in a lot of different environments. I passed it on to my son when he deployed to Iraq and he put it through its paces too. It is now home, retired as it should be like any good Marine. Part of owning any knife is to know its limitations. In almost every situation I have encountered on the part of someone with their knife is their own limitations and not knowing how to use what they have or take care of it either. A Mora is a great survival knife in the hands of someone who knows how to use it. chris97, Gizzybear, gila_dog and 28 others like this. Unc traded smokes for a 225Q. Said it was great for opening C-rat cans. central joe, DirtmanDave, Winterhorse and 4 others like this. As an old jarhead I carried my issue KA-BAR to many different climes. It served me well enough. It now resides in a place of honor in my home. chris97, Gizzybear, JeffG and 22 others like this. First off, you do a good job of video and editing your work. However, your recounting of K-Bars history as far as it's place in WW-II is way off from the real beginnings of the Mark II Marine and Navy fighting knife, the actual credit for the design belongs to Remington Arms Cutlery Division. The Marine Corps Fighting Knife came about around 1939 when the US Military anticipating our involvement in the war engulfing Europe began working on procuring upgraded military hardware, the military needed a new utility/fighting knife, the military sent out a request to cutlery makers to submit designs using a vague statement of requirements. One of the first Companies to respond was PAL Cutlery who a few years earlier had purchased the rights and tooling of the Remington Arms Cutlery Div., PAL sent in the specs. and a Remington Pattern of their Hunter model fixed blade knife, it had an oval metal pommel, leather stacked handle, small guard, and a five inch clip point blade that included a fuller grove. The military accepted the design as it was presented by PAL Cutlery with the stipulation that it be made in two models, one with a 7" blade for the Marine Corps, and one made with a 6" blade for the Navy, PAL did as requested, the 7" knife was marked PAL RH-37 on one side of the blade and USMC on the other near the guard, the 6" knife was marked PAL RH-36, the RH for Remington Hunter, 36 designated the 6" blade, 37 designated the 7" blade. PAL being a small company that had been in the business of making scissors and pocket knives could not furnish knives in the numbers requested so other companies were licensed by PAL to use the design to make the knives for the US military, K-Bar wasn't the first and wasn't the main supplier. After the war PAL turned it's production to making pocket knives for the BSA, the other Mark II makers went their own way, K-Bar continued making the Mark II for the military and for civilian distribution, the USMC fighting knife is assumed to be the construct of K-Bar Cutlery, but that's not quite the truth. Lastly, there are a lot of heavy duty knives on the market that are qualified to be called survival knives, most of the Becker models and the USAF Pilot Survival knives are good examples, and most good quality Bushcraft knives would also give good service to that end. I've spent a good deal of my long life hunting, fishing, hiking, and camping, much of it in the company of very experienced woodsman and have never witnessed any of them use or misuse their knives in the manner that you've presented in your K-Bar videos, no offense intended but the title dumb & dumber came to mind about a third of the way through the test video. Also, IMHO you really are over playing the business aspect of your videos, you do show a lot of potential, but perhaps with a little more research on your part, more real world outdoor experience, and skip the destruction tests, no experienced woodsman or survivalist treats his/her life saving tools to that kind of abuse. chris97, Danmanrn, central joe and 7 others like this. I carried a Randall 14 for over 30 years....its been around the world multiple times and in to many countries to list...it had opened many MRE's, punched holes in 55 gallon barrels and has been called upon to do more than ever expected from a knife...if I recall correctly when I bought it in 1985 it was billed as an "improved Ka-Bar"...so it has a storied lineage...its 10% the tool and 90% the user...take care of your knife and it will take care of you. JeffG, grey mouse, Danmanrn and 9 others like this. "This agreement entered into this 17th day of January, 1941 by and between Remington Arms Company, Inc., a corporation organized and existing under the laws of the State of Delaware, having a principal office at Bridgeport, Connecticut, hereinafter referred to as "the seller" and Joseph L. Mailman, Besse M. Kraus, Otto E. Kraus, Mary Langner, citizens and residents of the State of New York and Abraham L. Mailman, a citizen and resident of Montreal, Canada, all doing business as partners under the firm name of PAL BLADE COMPANY, having a principal office at New York, N.Y., and hereinafter referred to as " the buyer, ..."
What is the source for the rest of this story? "All the while Kabar [sic; actually, Union Cutlery until after the War.] was working on a machine to shape the leather handles without human help. They needed to accomplish that before they could commit to heavy production. The red spacers were in the handles to help the human hafter on the grinding to prevent marring the guard and removing the finish. The first design was made in sample amounts in 1941. 1942 started with larger amounts being purchased but still no official approval. It was still in the test and development stage. The final approval came in late 1942. The familiar blueprints seen on the current Ka-Bar box show the third redesign. This can be seen on the blueprints as 1219C2c dated 9 Dec 1942, with the "c" designation being the numerator but keeping the Official adoption date as 23 Nov. 1942. The Red Spacer Ka-bars should be in leather scabbards with small round head rivets. These were superceded [sic] with the staple design. The Marines never did adopt the hard scabbard although they did test it. Anyway that's what I have put together from research over the years." central joe, blind & lost, Swampdog and 3 others like this. No. Iconic but made cheaply in large numbers. central joe, blind & lost, Winterhorse and 2 others like this. So just wondering...if it entered service with Marines against the Japanese, what was the Japanese equivalent? central joe, blind & lost, Winterhorse and 1 other person like this. I was very good friends with an ol timer. He had a Ka-Bar. He was a world traveler. He had been to places like Korea,Honduras, Haiti, and quite a few other places he didn’t talk about. He had a definite affection for that knife, never remember a time when it wasn’t in arms reach. I don’t know about it being a hard use knife because I see no sense in hammering a knife in a tree and doing pull ups on it. What I do know is that a Ka-Bar has been the death knell for many a southeast Georgia boar hog. JeffG, gila_dog, central joe and 7 others like this. You are right about the purchase date between Remington Cutlery and PAL, I researched the history of my PAL RH-36 many years ago and was posting from memory and confused the design date of the Remington Hunter model which was in the mid '30's with the sale date between the two companies which was about 1940. But I stick to my story that the knife we know as the Ka-Bar USMC fighting knife is actually the Remington Hunter model knife that was accepted by the military from PAL Cutlery and not the brain child of Ka-Bar. I also contend that while a decent knife IMHO the Ka-Bar produced knives were never as good as most of the other fighting knives being made by some of the other contract makers of that time, also in my opinion, when talking about the USMC fighting knife as a survival option, I'd be more prone to go with Ontario's (bolt knife) Pilot Survival knife (with a few slight modifications). As for the OP, I think the kid means well, I also think he's using this forum more to push his business than to be informative and helpful, I also believe from watching some of his other videos that at the present he lacks the experience and knowledge of what he's talking about for me to consider him credible. Another reason I don't have any trust in his posts is because he has blocked any and all information about himself on his profile page, what's up with that ? LOL, I just noticed that he's been hit with the Ban Hammer. central joe, blind & lost, glen1100 and 6 others like this. I watched some of the videos and read the comments, not surprised. central joe and blind & lost like this. Gary V, Winterhorse and central joe like this. I'm surprised this thread wasn't locked. The OP got himself banned. LostViking, M.Hatfield, MrFixIt and 3 others like this. I have had my Kabar 7" since 1969. It has opened cans, boxes, dug in the dirt, and cut a lot of stuff. I have sharpened it and waxed the leather handle many times. Finally got a new sheath for it 3 years ago. I have never battonned it or used it as a pry bar. It now resides on the wall in my office as it has been replaced by a modern knife by a maker on this forum. Every time I happen to look at it, it reminds me of many people and places, both good and bad. Many people knock them but many people love them. Mine did its job many times over. Timex, Gary V, gila_dog and 10 others like this. I made the mistake of trying to baton with my Kabar. I learned the value of full-tanged knives for that task. Well at least you didn't drive it into a tree and try using it as a stepping peg or a pull up bar. Next time try a hatchet and work up to an axe if you have to and use a particular knife for what it was made for. Timex, Gary V, JasonJ and 4 others like this. I'm certainly no expert, knife-wise or otherwise, but I would trust my life to my USMC Kabar. From the jungles of Vietnam (by my brother) to the door pocket of my truck where it currently resides, this knife has been used hard, beat up, neglected, its original leather sheath worn out and replaced with a more modern one by a generous gift from @Swampdog. But it still gets used for tree branch chopping, yucca stick trimming, firewood splitting, and anything else I need a big knife for. Does that make it a survival knife? I think so. It is the best in the world? I don't know, but it's the best one I have. Skeptiksks, Timex, Gary V and 11 others like this. Another Jarhead here, I bought a Camillous Kabar as apposed to the issued Kabar that was questionable in its manufacturer. I used it as a utility knife first and a fighting knife secondary. My fighting knife was a Gerber Mark II, because that design is basically like a Saturday night special only good for killing a man. The Kabar worked for everything else with in logical reason. Timex, Gary V, JasonJ and 2 others like this. I think a large part of the Kabar's history is attributed to "it was the only". When a piece of gear is issued, and you don't have your own, you make due. Don't get me wrong, am very fond of the Kabar, but a large part of that was/is because there was always one within arm's reach. Superior knife? Not so much. Issue sheath? Meh. But a good solid tool, familiar in the hand, easily sharpened in the field, easy to maintain and easy to replace? You bet. Swampdog, Timex, Gary V and 3 others like this. More common. if less subject to myth. JasonJ, MrFixIt and Stag Ts like this. Carried one on every deployment while in the Marines. Steel was too soft for my liking and I want a full tang. Timex, Gary V, JeffG and 1 other person like this. Im just guessing but probably just the bayonet for their Arisaka...??? Gary V, MrFixIt, VtBlackDog and 1 other person like this. I'd agree with that for enlisted men at least. NCO and Officers were frequently seen with swords, many issued a few family treasures. That long bayonet with the curved tang was deadly in their night suicide charges. The Marines went through a long process to decide on a fighting knife and early campaigns saw a lot of variation in fighting knives from WWI era trench knives (complete with brass knuckle guard) to Fairbanks stilettos (popular with the Raiders), machetes, and various personal hunting knives. Gary V, JeffG, MrFixIt and 2 others like this. I learned a long time ago that whatever the technical deficiencies, for some people criticizing the USN Mk II and the BAR is effectively being unpatriotic. So I tread lightly in those areas. Somewhere on line there is a detailed report on a group of forensic anthropologists identifying USMC remains from a quite early war fight. Interestingly the knives they identified were clearly stuff the Marines brought with them from home-a Robeson easy opener, as an example. MrFixIt, JeffG and Gary V like this. I picture a survival knife as something you can EDC because during an emergency you will have what you happen to carry in your pocket or on your belt. The MK2 is a bit large for EDC. For this reason I consider a good SAK the best choice for survival. Now if you are lost in the woods and a genie shows up and asks you what kind of blade you will wish for then maybe the MK2 is a good choice. holygoat, MrFixIt and JeffG like this. 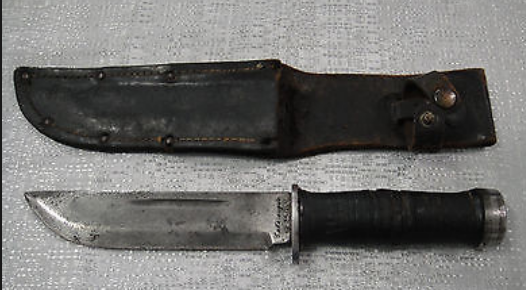 My uncle in the Infantry went to war with his Remington Boy Scout "Sport Knife" sheath knife - which he left to me. JeffG and MrFixIt like this. Sir, if you don't mind, how did you display your older KABAR? I was thinking of something similiar with mine. I made a base for it that the pointy end fits in out of a piece of birch from a downed tree. I would give a pic but it is in a box in my storage unit while I build my house. I will try to find an older pic. Thanks. No need to look for that pic. I am certain I can find some display ideas on the net. They are certainly not the best knives, but the KABAR and my SAK was all I had.